A snow turkey who'd da thunk it?! Love the snow turkey. Can't believe you have that much snow already! I like snow but not until Christmas here. Thanks for stopping by. Happy WW! how cute is this? i never would have thought of a snow turkey! happy ww! How cool...I've never seen a snow turkey before! I love the snow Turkey. lol. I love the snow turkey. 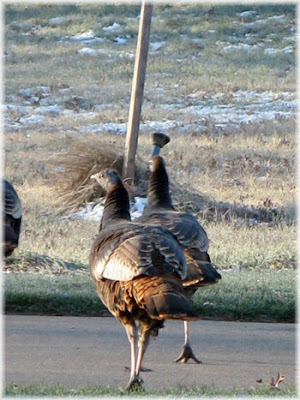 But honestly, if I would have seen REAL turkeys out my window, I would have freaked. I'm SO scared of turkeys. It may seem silly but it's left over from childhood. I was chased by one mean turkey and I never forgot about it. That's adorable. Ha! Happy Wordless Wednesday & Thanksgiving! How neat! Love the snow turkey! Too cute!! We usually never see snow until late January!! 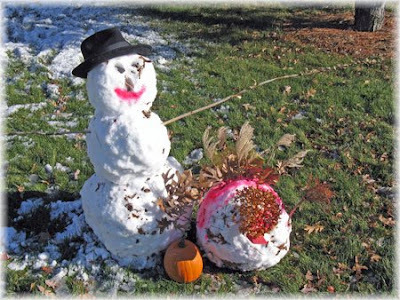 The snow turkey is so great! a MAGICAL WW to you! Oh my gosh!!! I love the snow turkey!!! Tooooooo funny. I hail from sunny AZ so there's not a drop of snow here. In fact, it's 71 degrees here right now. I forget now how I found you, but this is fantastic!! Those birds have some nerve.... one would think they would be in hiding. One more day and their off the hook (table :) for another year. Cute pictures. Oh we want snow. There is a chance for snow tomorrow. We are in Colorado, and it is unseasonably warm! boo! A snow turkey is very unique! Great idea! I love the snow turkey:) Too cute! LOL I have never seen a snow turkey before.